I got this as a mail from GTBank some minutes ago and decided to share it here. You will find the GTBank internet security tips you need to know and perform. This is to save you from losing your hard-earned money just because you failed to perform the required security tips. 1. Never login to GTBank internet banking through a link from your email, even if the email appears to have been sent from GTBank. 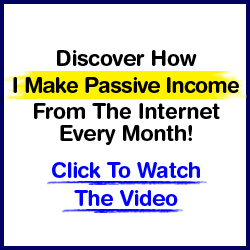 Type the web address in yourself. 2. The beginning of your internet banking page address will change from “http” to “https” when a secure connection is made. 3.Be wary of any unexpected pop-ups that appear during your online banking session as our software doesn’t allow external pop-ups. 4.Subscribe to SMS alert to view each transaction in real time. If you receive an alert for a transaction you did not initiate or authorize contact GTConnect immediately. 5.Fraudsters sometimes try to trick people into making a real payment by claiming “it’s just a test”, don’t fall for it. 6.Make sure your contact details with the Bank are up-to-date so you can receive SMS alerts on your mobile devices. 7.Never give anyone your login details in full either by email or over the phone. GTBank will never request these from you. 8.The login pages of our Internet Banking are secured through an encryption process, so a locked padlock or unbroken key symbol should appear in your browser window when accessing your GTBank Login page. 9. 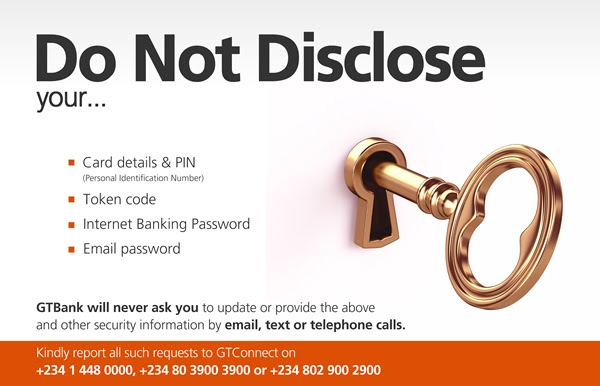 Please, also note that GTBank, its staff or agents will never call or send you an email to request any of your passwords, token generated codes, card details or Personal Identification Number (PIN).